This program calculates the Flux Density of the Solar and Jovian bursts as a function of the measured temperatures. Many of us have a calibrated noise generator to estimate the temperature of the Jovian or Solar bursts and of the background sky, but if we compare the temperatures of the same burst recorded by different systems having different antenna gain or different bandwidth we will see different burst temperatures because the power, and the associated equivalent temperature collected by the antenna, will be different. The temperatures are different but the flux density, that is, the power landing on a square meter per hertz of bandwidth will be the same. This simple program calculates the flux density of the Solar and Jovian storms, as a function of the measured temperatures. Enter the ANTENNA parameters : Frequency, Antenna gain, Bandwidth. You can enter a comment in the "Antenna Identifier". This can be useful when you want to take a snapshot of the window and you used one amongst several antennas (Dual-dipole, Yagi, Moxon, Tee-pee,...) and you want to identify it. 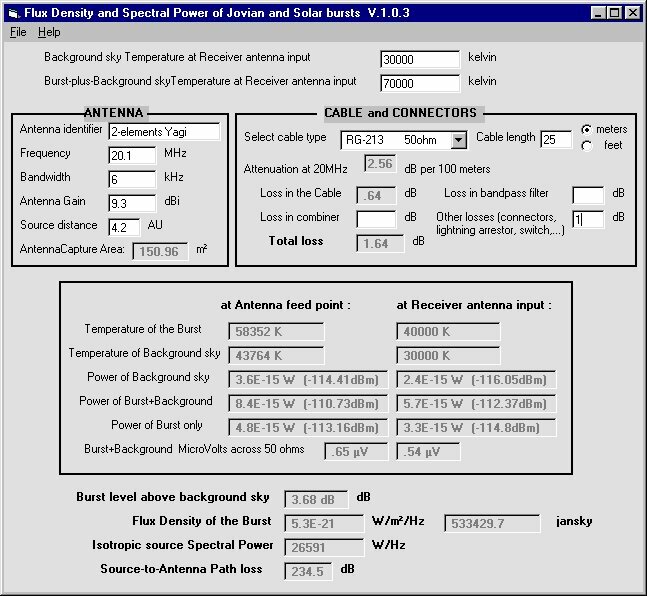 Select the CABLE connecting the antenna to the receiver and specify its length, this gives the value of the attenuation introduced by the cable. If there is a band-pass filter enter its loss (positive value). Enter the loss added by the antenna connectors and by a lightning arrestor, if any, and the loss of any other device inserted between the cable and the receiver (for example a switch box to select among several antennas). For the RadioJOVE dual dipole enter the loss introduced by the power combiner. Typical values are 1.8 dB for the band-pass filter, 0.5dB for the combiner, 0.1 dB for a lightning arrestor. The loss in a connector at 20MHz are very low, it can be estimated at about 0.01dB. The program will now show the Flux Density, in W/(m²Hz) and in jansky, of the burst and its level (dB) above the background. The Power and Voltage (across 50 ohm) at the antenna feed point and at the receiver input are also shown. The Isotropic source spectral power and the Source to antenna path loss are shown. If the user changes a parameter, for example the temperature of the burst or the antenna gain, then the output is automatically updated. With this version it is now possible to save the results to a text file and to print the screen. The cable, connectors, filter, power combiner and other devices connecting the antenna to the receiver introduce an attenuation. This means that the power (Pa) of the burst is higher at the antenna feedpoint. Pa = Pr * 10^(AttdB/10) where AttdB is the attenuation, in dB, introduced by the cable and its accessories. The FLUX DENSITY of the burst is the power landing on Earth on a square meter and per hertz [W/(m²Hz)]. The associated electromagnetic wave can be linearly, circularly or randomly polarized, its polarization can also vary over time. The BURST LEVEL above background is given by 10log(Ttot/Tsky) where Ttot is the temperature of the burst plus the background sky and Tsky is the temperature of the background sky only. The ISOTROPIC SOURCE SPECTRAL POWER is the power emitted by the source on a 1 Hz bandwidth. SOURCE-TO-ANTENNA PATH LOSS: by definition the Path Loss assumes that both transmitter and receiver antennas are isotropic. 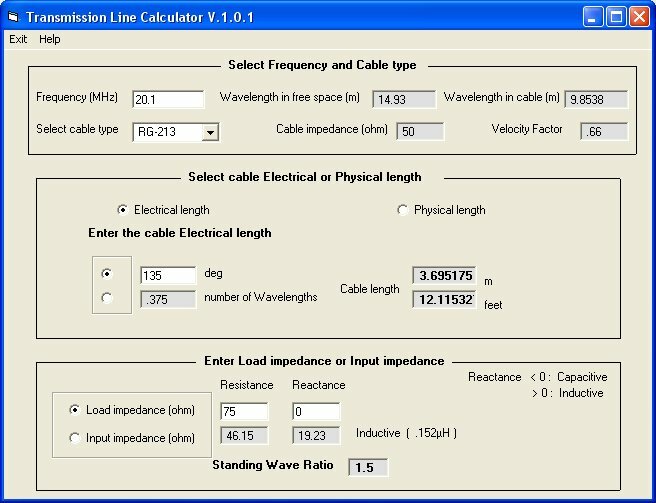 This program has been developed as an aid when converting the length of a coax cable from electrical to physical length and vice-versa. It can also be used to calculate what's the impedance of the load (antenna) when the impedance at its input is known. Or the input impedance when the impedance of the load is known. The Standing Wave Ratio (SWR) is calculated. so that the wave travels more slowly in the cable. The wavelength in the cable is therefore shorter than in free space. The Standing-Wave-Ratio (SWR) is defined as the ratio of the maximum voltage to the minimum voltage along the line. An SWR = 1 indicates that the load and the line are matched, so that there are no reflections.